The publisher calls this a Young Adult novel, but it should be read by adults, too. Sharenow weaves real events and people into this hugely engrossing story. It begins in 1934: Hitler is now Germany’s chancellor and Karl Stern, Jewish by birth but Aryan-looking, is 14. His looks and lack of connection to his Jewishness won’t protect him from his classmates. After he’s severely beaten, boxer Max Schmeling, his father’s friend, offers to teach him to box. The story’s increasing complexity and terror, coupled with multi-dimensional characters and first-rate writing, make the book impossible to put down. 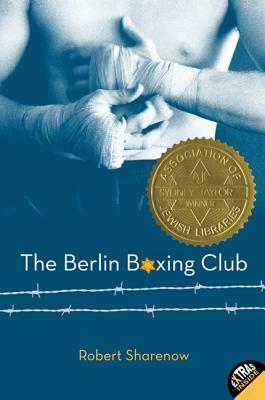 Sydney Taylor Award-winning novel Berlin Boxing Club is loosely inspired by the true story of boxer Max Schmeling's experiences following Kristallnacht. Publishers Weekly called it "a masterful historical novel" in a starred review. Karl Stern has never thought of himself as a Jew; after all, he's never even been in a synagogue. But the bullies at his school in Nazi-era Berlin don't care that Karl's family doesn't practice religion. Demoralized by their attacks against a heritage he doesn't accept as his own, Karl longs to prove his worth. Then Max Schmeling, champion boxer and German hero, makes a deal with Karl's father to give Karl boxing lessons. A skilled cartoonist, Karl has never had an interest in boxing, but now it seems like the perfect chance to reinvent himself. But when Nazi violence against Jews escalates, Karl must take on a new role: family protector. And as Max's fame forces him to associate with Nazi elites, Karl begins to wonder where his hero's sympathies truly lie. Can Karl balance his boxing dreams with his obligation to keep his family out of harm's way? Includes an author's note and sources page detailing the factual inspirations behind the novel. Robert Sharenow is an award-winning writer and television producer. His most recent novel, The Berlin Boxing Club, was awarded the Sydney Taylor Award by the Association of Jewish Libraries and received starred reviews from Publishers Weekly, School Library Journal, and Kirkus Reviews. He also serves as executive vice president and general manager of Lifetime. He lives in New York with his wife, two daughters, and their dog, Lucy. “Set in Berlin just after Kristallnacht, this isn’t just a story about the terrible events in Nazi Germany, it’s also a story about identity, family, and growing up” (in the article “11 Children’s and YA Books to Help Remember the Holocaust’).